TIP 1 Choose the smallest possible Hoop or Frame to accommodate the design. This creates even tension and keeps the design properly registered. TIP 2 Leave 1/2 inch clearance around the design for the presser foot. TIP 3 For the best uniform grip and tight registration of material, use a round hoop whenever possible. TIP 4 Adjust the outer hoop correctly before pressing in the inner hoop. If the outer hoop is loose or tight, remove the inner hoop and start over. Try not to adjust the outer hoop once the inner hoop is inserted. TIP 5 Double-height hoops provide more gripping surface for thicker or slippery fabrics. TIP 6 Fabric tension in the hoop should be taut. Run your finger across the fabric to check for slack or loose tension. TIP 7 Be sure to take advantage of all the easy to use features and time-saving benefits of your hoops. Professional embroiders are challenged by the extensive variety of hoops and hooping options which make selection crucial for successful and profitable embroidery results. 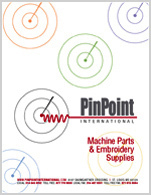 At PinPoint International we partner with the most innovative and leading hoop manufacturers in the embroidery industry. Selecting the right hooping method and how well you hoop your material will impact your finished product and may directly affect your bottom line. Check out our tips below to assist with hooping techniques.